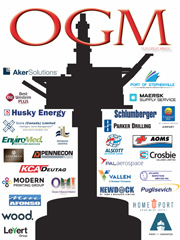 Way back in 1980, an oilfield was discovered offshore Newfoundland. They called it Hebron. 37 years later, that discovery has materialised into a mammoth oil project that will not only support world oil demand, oil and gas operators, contractors and suppliers but brings incredible prosperity to the people of Newfoundland and Labrador. 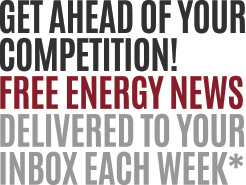 If you think oil and gas are not that important anymore, or that “new energy” is the in-thing and will replace oil and gas anytime soon – think again. Oil and gas are global necessities that are so much in demand that combined, they remain the number one commodity on the planet. That’s why companies and the smartest minds on earth are investing in oil and gas and in Newfoundland’s offshore. Follow the global energy giants and watch where they are investing, and you are likely to see emerging patterns of where the payoff may be. 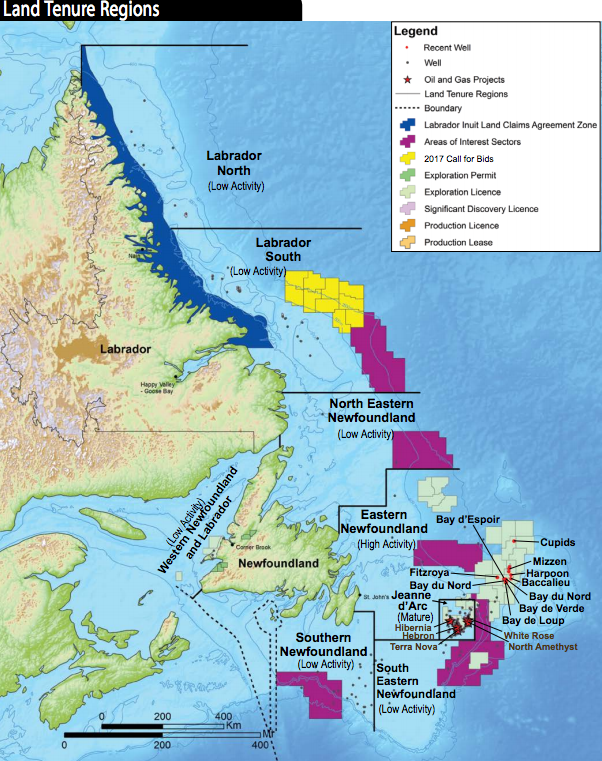 That’s good news for Newfoundland because major oil companies from around the world are spending billions of dollars staking claim to lands, which give them exploration rights in the hot offshore region. Over the last ten years, royalties from the province’s three producing offshore projects (Hibernia, Terra Nova and White Rose) have totalled over $19 billion. 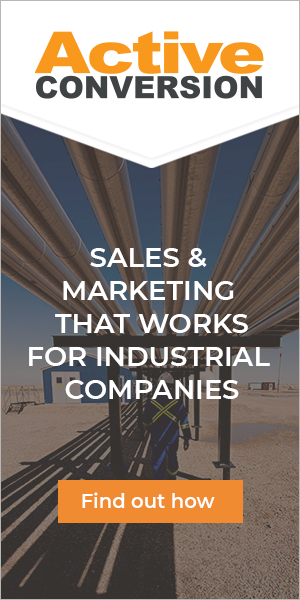 These substantial investments by industry in the Newfoundland and Labrador economy have led to significant growth in the local supply and service industry. Collectively companies involved in Hibernia, Terra Nova, White Rose, and Hebron have spent more than $23 billion in the province to date, which represents more than half of all provincial project expenditures. Royalties and other financial benefits from Hebron to the province are estimated to be over $10 billion as of January 2017. At its peak, the Hebron project employed over 7000 people, with over 5000 at the Bull Arm Site. 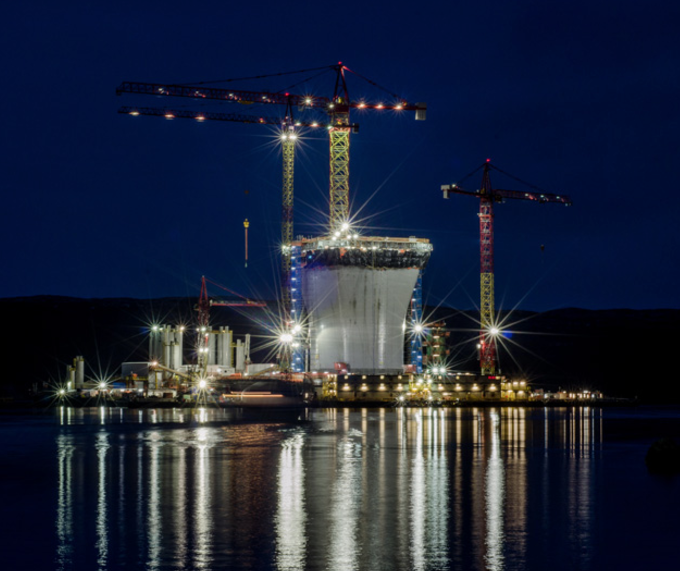 As of December 31, 2016, there were 3,756 people working on the Hebron project in the province, of which 91.0% were Newfoundland and Labrador residents. The winding down of construction means the end of an employment era that has been lucrative for the people of the province. It has left everyone asking, what’s next? 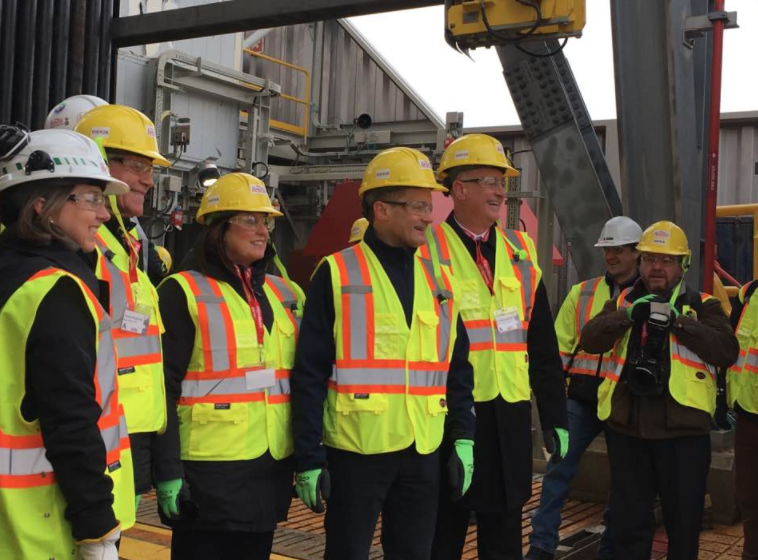 Hebron is a major project that has delivered significant benefits to Canada, particularly to Newfoundland and Labrador in the areas of engineering, fabrication, and construction. It has provided employment and created a diverse workforce, and provided research and development opportunities, along with significant royalty and tax revenues. Hebron is expected to generate $10 billion in royalties and benefits over the next 20 years for the province of Newfoundland and Labrador. The Hebron GBS is designed for an oil production rate of 150,000 barrels per day with an estimated 30-year lifespan.The total capital cost of the project is estimated at more than $14 billion. Four of these components were produced in the province locations including Bull Arm; Port aux Basques; Marystown; and Mount Pearl. 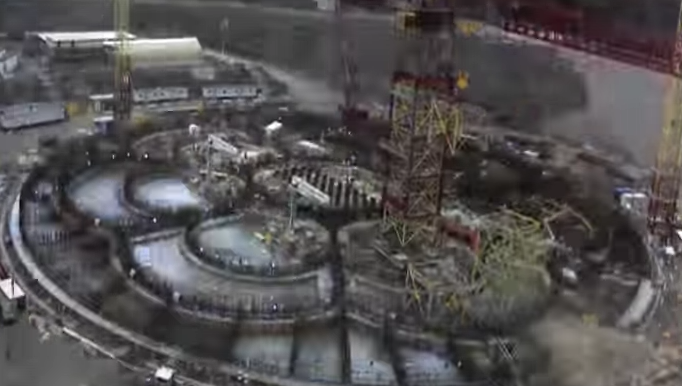 The derrick equipment set and the utility process module were fabricated in South Korea. The last component to be delivered to the Bull Arm site, the utility process module, arrived from South Korea in September 2016. Integration of the topsides components and mating onto the GBS was completed in December 2016. Hook-up and commissioning will continue until the platform is towed to the Hebron field mid-2017. First oil is expected in late 2017. Undeniably one of the highest safety records in the world, the Hebron project boasts a safety record of 40 million hours in the province, without any lost time injuries. That’s truly incredible for a project of this size and scale. You can think of the Hebron project is a man-made castle that will live out its life in the sea. Made by the minds of geniuses, the Hebron platform is architected and constructed with precision and power. 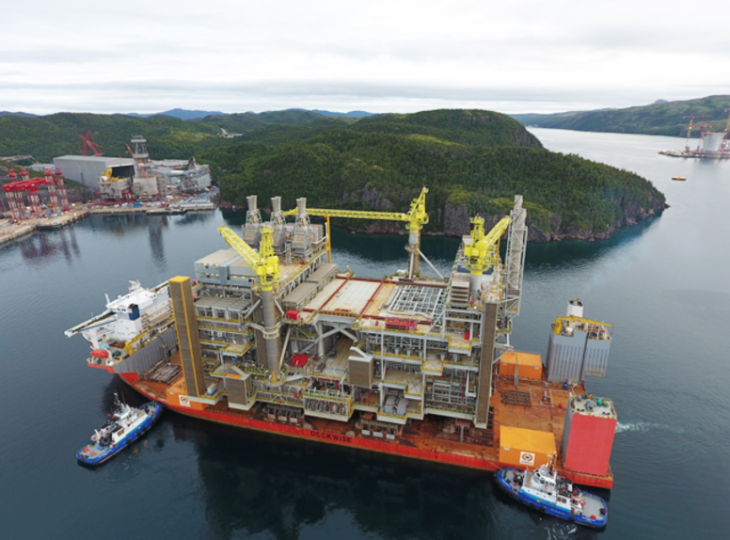 Hebron is a world-class mega project with a chosen gravity base structure to delineate resources 300 miles offshore Newfoundland, in a place known for icebergs and harsh weather. Some have called it Iceberg Alley others call it home. IYit is the very same waters that engulfed the Titanic after it hit an iceberg and sank. That didn’t stop the creative minds of the oil and gas industry. In fact, it was a challenge worthy of their fortitude, and it made them even more determined to overcome the various obstacles of this region. The Hebron project has the finest engineering and construction that will endure some of the harshest weather conditions on the planet. 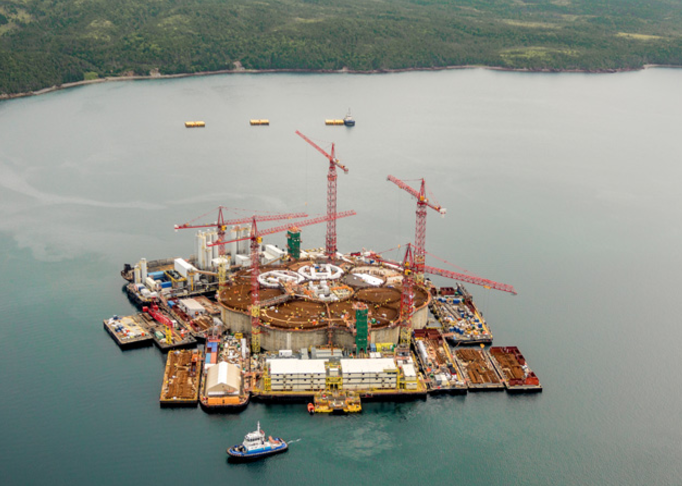 Like its sister project Hibernia which has been in operation for 20 years offshore Newfoundland, Hebron’s gravity base is designed to withstand ice impact, brutal storms and wave conditions. However, most icebergs are lassoed and pulled out of harm’s way, before they ever reach the Hebron platform. The GBS consists of a reinforced concrete structure designed to withstand sea ice, icebergs and meteorological and oceanographic conditions. Imagine what it took to make that happen. All of this is truly a technological wonder. The Hebron project owners consist of ExxonMobil Canada Properties, Chevron Canada Limited, Suncor Energy Inc., Statoil Canada Ltd., and the Newfoundland and Labrador provincial energy company, Nalcor Energy – Oil and Gas Inc. 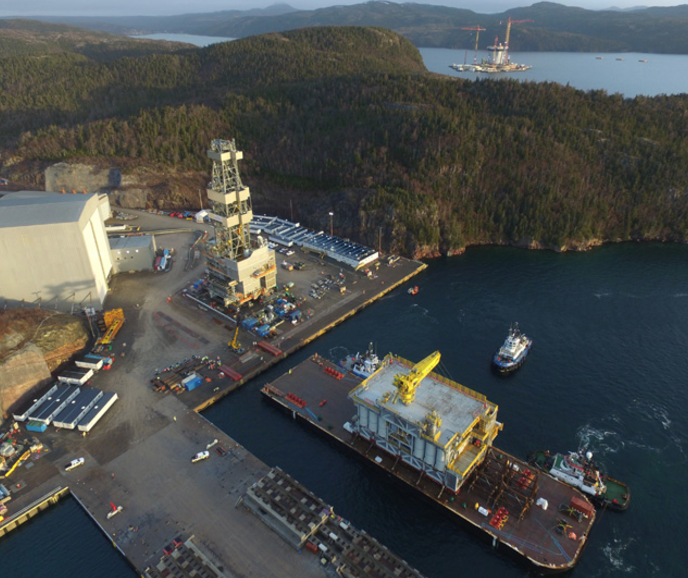 In May the Hebron platform will be towed out from the Bull Arm Site in Newfoundland, and first oil is expected in late 2017. Recoverable reserves are estimated at over 700 million barrels and with some time, that may prove to be even more, as was the case with the Hibernia project which began 20 years ago. 220 people will live and work on the Hebron platform. Equipped with state-of-the-art facilities, this platform sleeps like a cruise ship, operates as a hotel, and motors like a monster truck on steroids. It’s taken 14 billion to construct and when you stand within its frame and structure you begin to understand the sheer magnitude of this mountainous feat. 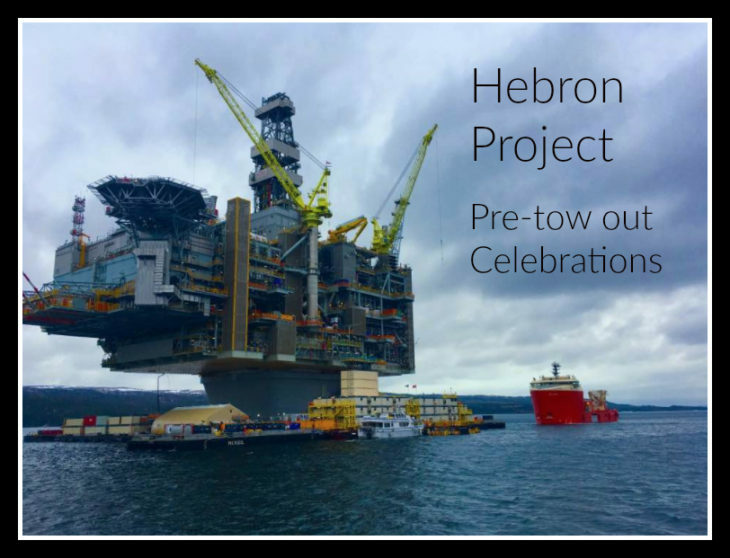 Invited by ExxonMobil to attend the Pre-Tow Out ceremonies, The OGM was honoured to spend the day exploring the intricate details of the Hebron platform with the other 200 guests. 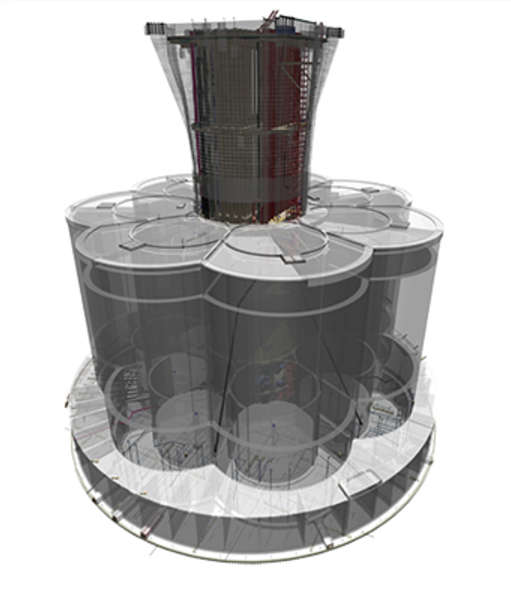 With the completion of the construction of the gravity base structure and the mating of the topsides, tow outcomes next. Today marked the commemorative “pre-tow out” accomplishment, where very proud business owners, major contractors, oil companies, suppliers and project workers, came together to celebrate the great feat of constructing a world-class mega-project. I jumped out of bed at 6 am for the drive to the Bull Arm Site. We checked in at 8:15 at the Nalcor building, where and were given a safety briefing. We were then equipped with Personal Protective Equipment (PPE). That means, steel-toe boots, hard hat, grip gloves, safety glasses and a safety vest. No beauty contest for sure. We were picked up by bus, dropped to the ferry, and promptly taken to the Hebron structure just minutes away. Looking up at it, you’d think that giants made it. The topsides are impressive, and the gravity base lay floating in the water beneath us as we all came aboard. One of the main considerations they had to take into account for the day, was how the weight of 200 people would affect the ballast of the gravity base. Generous with their time, resources, and knowledge, of the project we were given everything we needed to understand the workings of the Hebron platform from drill floor to helideck, from accommodations to catering services. Experiencing this platform was a rare, once-in-a-lifetime event. The day ended with a feast made for kings, music by the very best local Newfoundland guitarists, and as we left, we were presented with a beautiful framed photograph of the Hebron Platform at night. Nice touch! After a daylong tour up and down hundreds of stairs, and viewing the platform outside in chilling – 3C temperatures, one could clearly understand the hearty characters who work here each day. You can only tip your hat to those who worked on this project and those who will spend three weeks at a time working aboard her. Special thanks to Lynn Evans, Public & Government Affairs Advisor, ExxonMobil Canada, for such an informative experience. And thanks to all the workers who contributed to this momentous project. Hebron, she’s a graceful giant. A castle in the sea. A place that some of our brave workers will call home. A contribution to the world’s energy needs. We can all be very proud.